When looking to build an artifact deck in Commander, there are a couple staple commander choices to lead your deck. Sharuum the Hegemon, Memnarch, and Karn, Silver Golem seem to be the most popular, and I even see Arcum Dagsson every once in a while. While all those generals are fine choices, they also have a reputation of being scary combo decks and due to this they often adopt the role of Archenemy at the table from the very start of the game. This usually results in the rest of the table mercilessly smushing down the Archenemy into a poor, neutered thing, for fear of giving him/her the game if left alone. Slobad doesn't look like much on the surface, but after playing with him I'd place him up there with the more popular artifact generals in terms of power. His power is simply more subtle than the rest. Let's break it down. He can make an artifact indestructible until end of turn at the cost of sacrificing a different artifact. Seems like a steep price for a marginal effect, right? Only it isn't. Due to the high amount of artifacts and enchantments in Commander, nearly every deck runs some amount of artifact removal. They range from a hindrance to a board nuke against artifact decks. Commander staples like Austere Command and Oblivion Stone can downright cripple an artifact deck heralded by those other generals like Karn. But not Slobad. 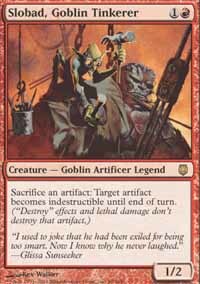 This resourceful goblin says that you get to choose which artifact dies to targeted removal, and it certainly won't be the one your opponent wanted to destroy! The power of choice is very strong. And artifact wipes are only half as strong against you, destroying only the artifacts you deem weakest. Insanely mana-efficient card advantage and repeatable permanent removal that also saves your other artifacts in the process? Yes, please! Only someone like Slobad can maximize good cards like these and turn them into allstars. Not bad for a 2cmc commander, huh? "But Doc!" you yell at the monitor, "Mono-red is terrible in Commander! It is teh 5uX0rz!" Not so, my negative friend. 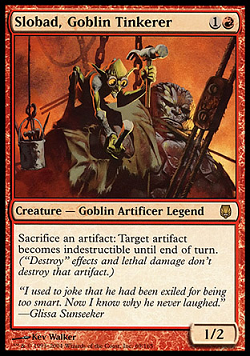 Red is a fantastic base for an artifact deck, especially one that is commanded by Slobad. Don't believe me? Well, let me show you my list, then! The idea behind the deck is to ramp heavily with artifacts early and keep the hand full with a variety of card draw. Winning comes by swinging in with big creatures such as Hellkite Igniter or blowing up the world with Obliterate while saving half your board with Slobad (more on that later). Straightforward ramp. Simple and effective for rushing out your big, flashy spells. All that early ramp will leave you with tons of mana but few cards left to cast, so refill that hand with tons of card draw! True tutors in red are hard to come by, but there are a couple good ones. Planar Portal is expensive but works well in a ramp-heavy deck like this. The one that people seem to be most afraid of, however, is Kuldotha Forgemaster. People think I'm going to infinite combo or something once I get it on the field. Honestly I don't know what they're expecting, but usually I grab something like Caged Sun if I need more ramp or Spine of Ish Sah if I need something destroyed. Temporal Aperture is probably the "worst" card advantage that I'm currently running. I usually find myself spending my mana on other things. I guess it's a pet card of mine, so I won't cut it. The card is simply fun! You can hit a land or you can hit a blowout Insurrection! I love the random element to it and it spices up games. A nice toolbox of anti-stuff to make sure your opponents don't win the game. Jester's Cap takes out combos. Stranglehold also stops combos and excessive tutoring. Grafdigger's Cage stops combos like entwined Tooth and Nail shenanigans, but also keeps graveyard strategies honest. Then we've got catch-all permanent destruction in Lux Cannon and Steel Hellkite, the former able to be abused with Clock of Omens, Voltaic Key, and Unwinding Clock, while the latter is a game ender by itself. There are two pieces of tech here that work so deliciously well in a Slobad deck. The first is Torpor Orb. I think it's safe to say more than half of all played creatures in Commander are ones with powerful ETB effects. In fact, many decks are built around abusing creatures with ETB effects, replaying them over and over. Torpor Orb crushes these immensely popular tactics. Unfortunately, all my other decks make use of ETB creatures too, so I could never find a spot for this lovely card, until now! 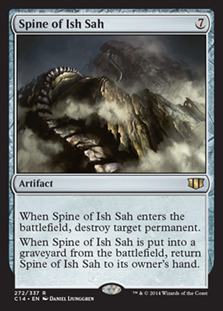 The second sweet tech here is, of course, Spine of Ish Sah. As I mentioned before, with Slobad you can replay it over and over, blasting away any pesky permanent on the table! We've got ways to copy artifacts, untap artifacts to re-use activated abilities, get artifacts back from the graveyard, make artifact tokens to sacrifice with Slobad, and other sweet stuff. My absolute favorite of the bunch, however, is Liquimetal Coating. The versatility in this card is astounding. You can coat a permanent to save it with Slobad, or make Shattering Spree and Hoarding Dragon destroy permanents instead of just artifacts, or blow up lands with Karn, or steal permanents with Hellkite Tyrant, it's just so fun and powerful! These are the type of cards that end games shortly after they resolve unless an opponent has an immediate answer. They all let you smash for a billion. Molten Primordial in particular doesn't get the attention it deserves in Commander. Like all the Primordials, this guy is a savage bomb. In your typical 4-man games, he's stealing 3 creatures and himself swings for 6 damage the turn he hits the field! It's amazing. Not quite Insurrection, but still very good. Speaking of Insurrection, fun fact: I've never lost a game that I cast that spell. It's that good. These cards are two most powerful tools available to Slobad. They wipe the board of all threats; all those giant creatures, everything. This is something the deck really needs. The land destruction is just gravy on top. You see, this deck runs TONS of mana rocks, and Slobad is here to save the best half of them at the very least, usually all of them when you have sacrificial artifacts. So while everyone else has their board cleared and no mana to rebuild, you have tons of mana to repopulate your board and quickly win the game. Plop down any of your bombs and it's over. Even though they're so powerful in this deck, however, be warned: I wouldn't run these cards unless your playgroup is okay with mass LD. It's a simple fact that mass LD is not the most loved tactic in Commander. I have a playgroup that accepts it as a necessary balancing point to other degenerate tactics, but not everyone feels that way. If the friends you play with hate mass LD, no good will come out of you running those type of cards. For replacements to these two cards, I would highly recommend one of them to be Blasphemous Act or something similar. You really need some sort of board wipe when creatures get out of control. There are tons of great mass LD cards in red for any type of occasion. Ruination ruins many manabases while leaving yours alone. Wildfire and Destructive Force are both board wipes and crush manabases. Wake of Destruction annihilates any mono-color deck. Keldon Firebombers is a nice way of hosing super greedy green ramp decks like the obnoxious Azusa decks that drop down Sylvan Primordials on turn 4 while not bothering other people so much. All of these are great options depending on your meta, and whether or not your friends accept LD in the first place. Moving on, there's more tech cards available. Relic of Progenitus and Tormod's Crypt are extra ways to hose graveyard-happy decks and Price of Glory is one way to deter countermagic. Illusionist's Bracers was a card that I was really excited to try out here. There are a ton of creatures with activated abilities that Bracers could duplicate. In about five games played I ended up drawing this card one time and it wasn't that special. I ended up cutting it for Swiftfoot Boots because I wanted more ways to protect Slobad and the haste effect was a boon too. It may be that Bracers is better here than I give it credit for though. I like the idea of cards like Reverberate, and I used to run a ton of them, but they're too situational for my tastes. I eventually cut down to a single Fork spell, Reiterate. Lux Cannon, Scarecrone, Stranglehold, Memory Jar, and Torpor Orb no longer fit the budget. These were replaced by Gauntlet of Power, Gauntlet of Might, Mind's Eye, Pithing Needle, and Lightning Greaves. It's interesting to note that virtual Lux Cannon is $6 while its physical version is only $1, and virtual Gauntlet of Might is merely $1 while its physical version is a whopping $98! Two of the most exciting upgrades to this deck would be Goblin Welder and Mycosynth Lattice. 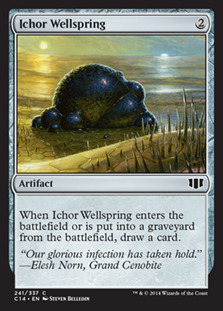 Welder is one of the best 1drops in the format, letting you recur important artifacts and also allowing you to mess up opponents by giving them worse artifacts. Lattice is Liquimetal Coating on crack. Lattice plus Karn means no more lands for opponents, or smash for a billion with Hellkite Igniter, or win the game outright with Hellkite Tyrant. Basically anything Coating does, Lattice does even better. I've never understood why moxen are banned but even more absurd stuff like Mishra's Workshop is allowed. Oh well. Thanks for reading. As always, budget general suggestions for future articles are always welcome. Slobad is actually pretty sweet. I used him in a budget Godo deck a while back and was always happy to see him. Being able to save stuff from being destroyed usually means that people would rather target other stuff than watch their spell fizzle. He's just a great deterrent and should be considered in any artifact heavy deck that has Red in it. Did you think about Strata Scythe? Can make Slobad (or any other creature) hit a lot harder, especially late game. I noticed in Game 1 you played Ruination, but it's not in your deck tech or deck list? I assume this may have been an earlier version and it got taken out? What led to that change? Also, I've been noticing a lot more of Obliterate and similar effects (mass land destruction) online, and most people aren't automatically dropping. What was your experience with this? The original Power 8 being banned is a whole can of worms by itself. Players go nuts over this issue. Yeah, I noticed that when Slobad was out people would just aim their targeted artifact removal elsewhere. That's a huge win and you don't even need to use his ability. Strata Scythe could be good. There's a lot of dorky utility creatures that wouldn't mind swinging for 10 damage. Ruination was the last card to be changed before the current build. It's very good but I had a game where people reacted very negatively to it when it randomly wiped out a player, so I took it out. I used LD in 3 games and each time it was met with drops. I guess I was unlucky though because my most recent game with a new test deck, there was a super cutthroat Sharuum deck that smashed the table with Acid Rain and no one reacted poorly to it. I'm not a fan of the current banlist. It seems very arbitrary and inconsistent to me. But then again it's probably not worth worrying about. I wonder if the problem with Ruination is that it isn't symmetrical. I'm just curious because I'm outlining a deck that may have some land destruction elements (shhh, Adamaro, don't tell anyone) and wondering just how far I can push it. Or if it's just Keldon Firebombers and Storm Cauldron. I dunno, I guess I might just have to play it and find out. This deck looks pretty sweet. I'm thinking that it might be funny to stick in a Hellkite Tyrant in and win off of him. I agree, he's super cool. Him and Mycosynth Lattice is absurd.